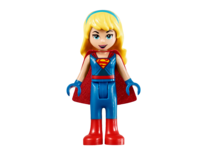 Supergirl is a Super Heroes minifigure which was first released in 2015. She appears in LEGO Batman 2: DC Super Heroes and LEGO Batman 3: Beyond Gotham as a playable character. Supergirl has Elsa Schneider's hair in the same colour. Her torso is blue and has the same "S" shield as Superman and wears the same belt. Her cape is also identical to the one used by Superman's video game counterpart, with the "S" shield on the back. She wears a red skirt and boots. Supergirl's Dimensions variant is the same as her DC Comics Super Heroes version, except her hairpiece is changed to the long ponytail which is also used for the Lifeguard. On consoles, Supergirl can be unlocked after all 250 gold brick are collected. She is based on her classic appearance and has all of Superman's powers, plus his vulnerability to Kryptonite. On portable versions, she is unlocked for purchase by finding the fifth minikit in "Robot Sky Battle" and costs 150,000 studs. In LEGO Batman 3, Supergirl is playable in a default costume based on The New 52. A variation of Supergirl in her classic costume (the same one which will be physically available in 2015) is also unlockable. Again, she shares Superman's powers. Default Supergirl is unlocked after player finds her in Nok and helps her defeat a number of Indigo Tribesmen she innadvertally frees while trying to explain the hard work she had. Classic Supergirl is unlocked after player collects a Character Token in a Virtual Mission Minigame. Kara is Superman's teenage cousin who was sent to Earth at the same time as baby Kal-El to watch over him and help raise him. However, she was cryogenically frozen in space and didn't age. Years later, when Kal-El was now an adult and a superhero using the name Superman, Kara landed on Earth, still a teenager. She gained powers from living under "a yellow sun" and became her cousin's partner, Supergirl. Unlike Superman and Batman who do not get along, Supergirl is close friends with Batgirl. Like Nightwing, Batgirl, Huntress, Black Canary, Shazam, Zatanna, Hawkman, and Hawkgirl, Supergirl occasionally works with the Justice League, which mainly includes Batman, Superman, Wonder Woman, Green Lantern, Flash, Aquaman, Cyborg, and The Martian Manhunter. Scarlet Witch shares her face with Supergirl. Supergirl and Lois Lane are voiced by Bridget Hoffman in LEGO Batman 2. This page was last edited on 21 July 2017, at 23:11.